When you think of the Muffaletta—which is almost as much fun to say as it is to eat—you may think of the Italian community of New Orleans. 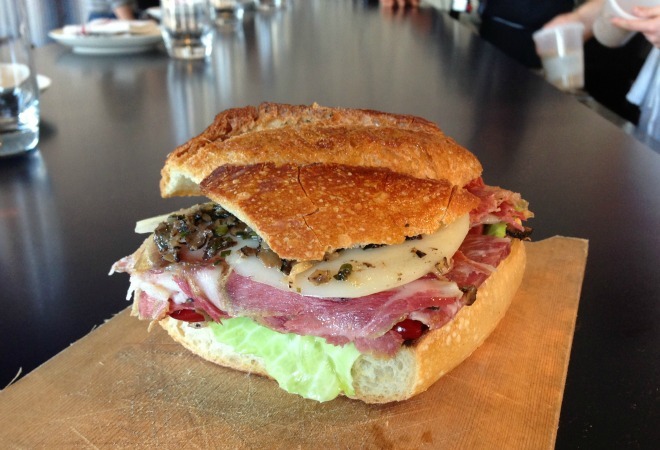 As of this week, you can also think of Venice’s Superba Snack Bar, which is just now serving this beast of a sandwich during lunch and brunch (Thursday, Friday, Saturday, Sunday). Below, chef Jason Neroni has actually shared his recipe for porchetta (can you believe it?!). That particular recipe may look intimidating, but is well worth the trouble. If an afternoon of meat roasting doesn’t sound like fun to you, feel free to use one of the suggested substitions instead. On the other hand, if an afternoon of meat roasting does sound good to you, please invite us over. Either way, make this hearty sandwich this Saturday and you’ll be satisfied until Monday morning. Layer porchetta on a small baking tray, top with sopressata and broil until sopressatta is crispy on the edges and porchetta is sizzling. Remove from oven and top with cheese. Put back under broiler and melt cheese. Meanwhile toast ciabatta roll and on each cut side of bread, spread 1 T of vinaigrette. Place meat and cheese on bottom piece of bread and top with lettuce. Put remaining vinaigrette over lettuce and top with tomatoes and bread. Cut in half and serve. sit at room temperature for a couple hours to allow flavor to combine. In food processor, combine garlic, rosemary, juniper, and black pepper. Process until spices are cracked open and the garlic and rosemary are minced. Combine spice mix with salt and sugar in a large bowl. Thoroughly rub salt mix and spice mix together until well incorporated. In a vessel large enough to hold the pork belly, sprinkle half the salt mix in the base of the container. place pork belly skin side down on to salt. Top belly with remaining salt, cover with plastic and allow to cure in the refrigerator for 36 hours. After curing take pork belly out of salt and rinse, allowing some of the spices to remain, pat dry. Cut the belly in half, giving you two squares of belly. Place belly skin side down on cutting board. with the non-cut side closest to you. Begin rolling the belly into a tight roll (think about rolling a sleeping bag up). Once rolled truss with the twine. Repeat with second belly. In a large roasting pan with a roasting rack, fill with water to just under the rack. Place porcetta on rack and wrap roasting pan with aluminum foil. Cook for 12hrs at 250F, checking on water level several times during cooking process. Once cooked remove rack from pan and discard water. Place rack with porchetta back in the pan and heat oven to 550F. Roast porchetta until golden and crispy. It is a quick process, don’t let it burn.